The Passeig de Gracià is one of the most famous boulevards in Barcelona, linking the historic city centre to the independent-spirited neighbourhood of Gracià. 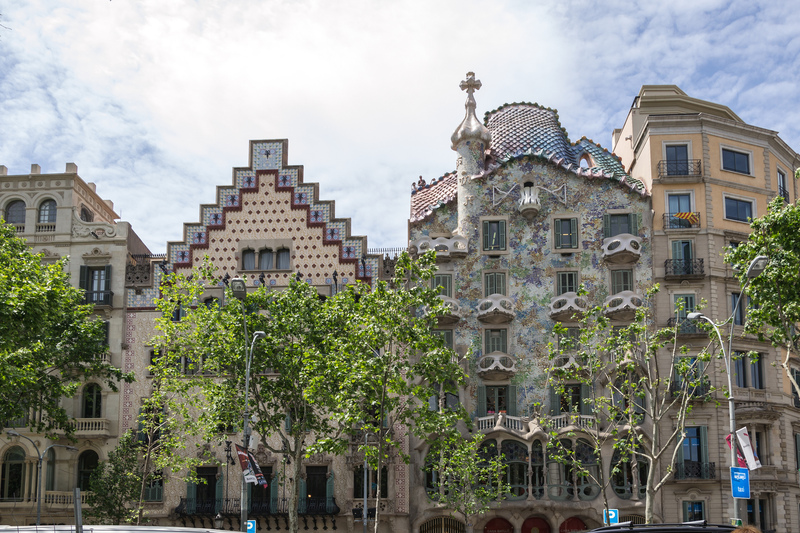 From luxury fashion stores to some of the most remarkable architecture in Barcelona, here are ten things to see and do on the Passeig de Gracià. The Casa Batlló is a prestigious townhouse and one of the most unmissable sights on the Passeig de Gracià. The house’s exterior was designed by the famous Catalan architect Antoni Gaudí – whose other masterpieces include the Sagrada Família and the Park Güell. With its striking appearance, the building is a fine example of the Modernist style for which Gaudí is renowned: there are virtually no straight lines anywhere to be seen and the building is almost entirely covered in mosaics. Often overshadowed by its neighbour, the aforementioned Casa Batlló, the Casa Amatller is another Modernist marvel on the Passeig de Gracià. The building was designed by the Catalan architect Josep Puig i Cadafalch at the turn of the 19th century and combines elements of Catalan Gothic and Flemish architecture. The building belonged to the Amatller family who ran a prestigious chocolate business which is still active today. The starting point of the Passeig de Gracià, the Plaça Catalunya is the main square in Barcelona and the meeting point of its two largest shopping areas. There are a number of noteworthy buildings around the square which played an important role during the Civil War – such as the Telecommunications Tower and the Hotel Colon. The fountain in the centre of the square bustles with life, being especially enjoyable in the evening when its water spots are illuminated. 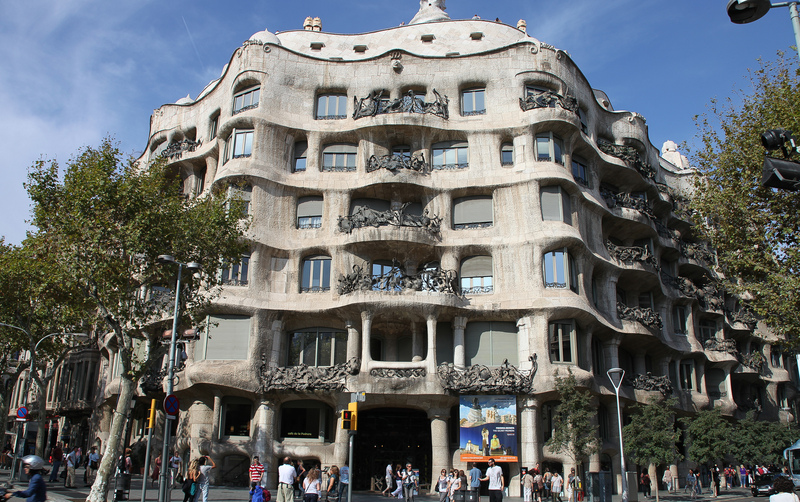 This striking building is best known by its local nickname ‘la Pedrera’ meaning ‘the quarry’. Designed by Antoni Gaudí, the Casa Milà was somewhat controversial at the time of its construction owing to its ragged appearance, with an undulating stone facade and stark iron balconies. However, it is now considered one of the city’s landmarks and attracts thousands of visitors each year. The Passeig de Gracià is famous for being the heart of designer shopping in Barcelona, compared by some to the Champs-Élysées in Paris. The choice of top brands is simply overwhelming: Louis Vuitton, Cartier, Channel, Tiffany’s, Stella McCartney, Gucci, Hermès, Zadig & Voltaire, Guess and more. There are plenty of cafés and outdoor areas to enjoy when you need a rest and – thanks to the architectural gems that line either side of the street – you can combine cultural sight-seeing and shopping at the same time. Another outstanding building on the Passeig de Gracià, the Palau Robert was once the private residence of Catalan aristocrat and politician Robert Robert i Surís. Its history is intricately linked with that of the city, having served as the seat of the Catalan Ministry of Culture during the Spanish Civil War. 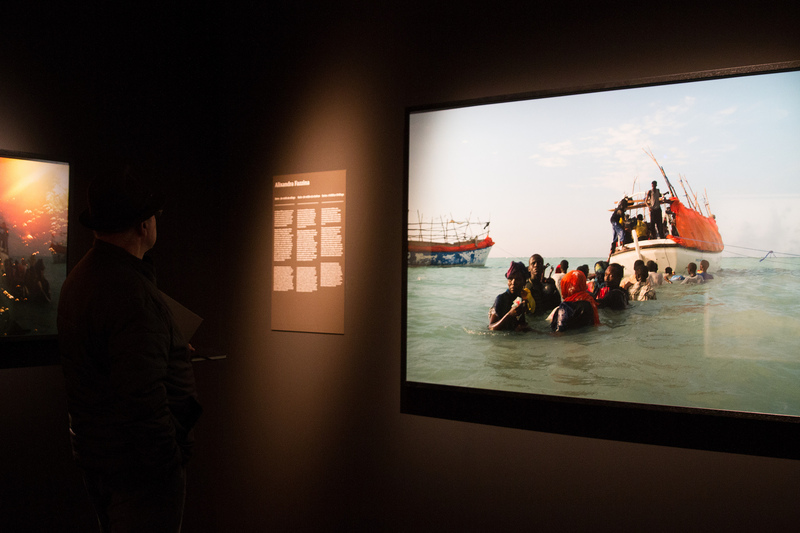 It was later acquired by the local council and today operates as a museum, gallery and concert hall open to the public. When it comes to shopping on Passeig de Gracià, the icing on the cake is a trip to the boutique Santa Eulalia. Originally located near the Boqueria market, this shop has long been a favourite of the city’s best dressed residents since it opened 1843. Alongside top brands such as Sonia Rykiel, Chloé or Kenzo the store also sells their own brand for both men and women. And no visit to Santa Eulalia would be complete without a stop at the Champagne bar for a little light refreshment afterwards. 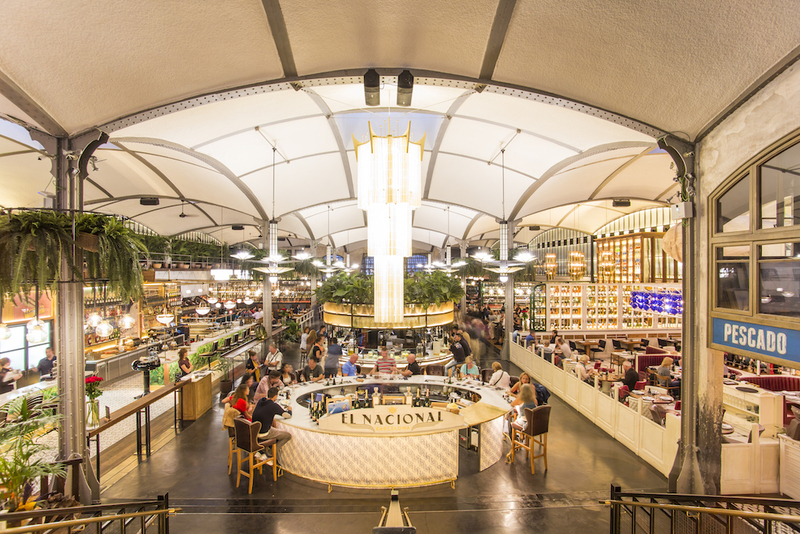 Tucked away down a small alley off the Passeig de Gracià, El Nacional is Barcelona’s first super-restaurant, containing five separate restaurants within. Housed inside a former garage, the building has been transformed with a stunning interior inspired by the Catalan Art Nouveau style but with an elegant, modern feel. At the centre of the room a lively tapas bar offers jamón Iberico and other cured meats alongside local Cava, while the steak restaurant serves heavily aged beef – something of a rarity in Barcelona. There are a number of interesting art galleries located towards the top end of the Passeig de Gracià which are worth including on your visit. The Galería Miquel Alzueta is a contemporary art gallery located in a 500m2 former factory just off the Passeig de Gracià, which represents emerging and mid-career artists such as Ivan Franco Fraca and Guim Tió. Not far away, the Klimt02 gallery exhibits pieces of jewellery from top contemporary designers such as Karl Fritsch, Gésine Hackenberg and Kevin Hughes. Historically, the Passeig de Gracià was designed to link the city of Barcelona with the nearby town of Gracià before it was later annexed by the city in the 19th century. Today Gracià is a vibrant neighbourhood which has retained much of its independent spirit: its home to some of the best independent and artisan stores in Barcelona, as well as charming squares and a lively nightlife. Complete your tour of the Passeig de Gracià by discovering this unique barrio, full of history and life.